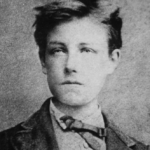 Arthur Rimbaud was a French poet who is known for his influence on modern literature and arts, which prefigured surrealism. Born in Charleville-Mezieres, he started writing at a very young age and was a prodigious student, but abandoned his formal education in his teenage years to run away from home amidst the Franco-Prussian War. During his late adolescence and early adulthood he began the bulk of his literary output, but completely stopped writing at the age of 21, after assembling one of his major works, Illuminations. "I saw that all beings are fated to happiness: action is not life, but a way of wasting some force, an enervation. Morality is the weakness of the brain." "Only divine love bestows the keys of knowledge."